We had the obligatory barrage of rumors regarding the soon-to-be-unveiled Galaxy S7, including a Samsung slip-of-the-tongue confirming the S7 Edge name of its sidekick that's expected to tag along. Moreover, archrival Apple will also have an eventful spring, with the small 4" iPhone 5se expected for unveiling on March 15th, together with the third iteration of the iPad Air, and a second edition of the Apple Watch. The more, the merrier, but it was another handset that was leaked shamelessly last week - the upcoming HTC One M10, which, from the looks of it, will have a different design than what we are used to with the M-line. You can preview all that mattered last week in the slideshow below. So far, we've had only tangential proof that Samsung might announce a version of the Galaxy S7 with a flexible display curved on the sides, like on the Galaxy S6 edge or S6 edge+. Well, we no longer need to guess if there is such a mysterious device in the making, as Samsung itself has listed a "Galaxy S7 Edge on its own website. The mention appears in the developers section of Samsung Mobile's pages, where it explains to developers how to use the Look SDK that is meant to create apps specifically for the unorthodox input methods that the company brings with its unique Edge displays and the S Pen stylus on the Note series. According to sources for 9to5Mac, Apple has set the announcement for Tuesday March 15th. At that event, it is expected that Apple will be announcing the iPhone 5se, the iPad Air 3, and new Apple Watch bands. The date isn't exactly set in stone but what we will see announced at the event seems pretty solid at this point. The iPad Air 3 will likely be a pretty standard update to the iPad Air line of tablets that could be slightly smaller but have a 4K display, and new Apple Watch bands are just that and nothing terribly exciting, at least not compared to the original expectation of the Apple Watch 2. An alleged HTC One M10 picture leaked out, indicating a new design language for HTC. This time we have what looks like an elliptical finger scanner beneath the display, and the black strip with the HTC logo has disappeared. The database of the Geekbench synthetic cross-platform benchmark is the gift that keeps on giving. After we were able to compare yesterday the Exynos-laden version of the Galaxy S7 for Canada's Bell Mobility against the Snapdragon-toting one for AT&T, now it's time for the T-Mobile model to pop up in Geekbench. It beats the AT&T version in Geekbench for a tad, indicating that a pretty powerful handset is in store for T-Mobile's subscribers once the Galaxy S7 hits the shelves there next month. 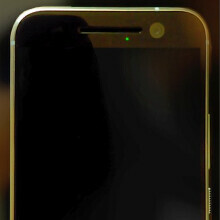 Why M10 leak looks like an iPhone? Apple shares some design patents with HTC.